Near small fishing hamlets along the coast of northwest India, the blue-green sea is speckled with islands of mangroves. It’s as picturesque a setting as you’ll find, but on some days, the tranquility is punctuated by a deafening sound: dozens of camels, like a fleet of furry ships, bleating and honking as they swim among the trees. The camels are followed closely by their human companions, who swim alongside the herd on small rafts, calling out to them and leading them to the islands where they feed on scrubby plants. Not only can the camels swim over three kilometers, locals say they can survive by drinking seawater. In fact, that’s where they got their name: “Kharai”, which means “salty” in the regional language of Gujarati. The Kharai camels—the world’s only swimming camels—used to be reared by the thousands by two traditional breeding and herding communities, the Rabari and the Jat. In 2012, there were just 4,000 left. The domestic breed is disappearing due to a decline in its mangrove habitat, and economic changes that are making semi-nomadic lifestyles harder to sustain. If the Kharai camels go extinct, so does a centuries-old culture. Historically, Kharai camels have also been used as draft animals, and as an important source of manure for local agriculture. Joshi has spent decades working with local people in the district of Kutch, located in the western Indian state of Gujarat. He says saving the district’s 2,000 Kharai camels has everything to do with conserving Gujarat’s mangroves, which provide over 70 percent of the camel’s diet. A major threat to those ecosystems is rapid industrial development. Since the early 2000s the Kutch coastline has become dotted with oil refineries, factories, and ports. Dredging and changes to natural tidal flows have caused the mangroves to vanish in some places. The good news for mangroves is that as the large-scale benefits of these ecosystems are better understood, the Indian government has become increasingly serious about their conservation, both in Gujarat and around the country. After losing around 40 percent of mangrove forests in the 20th century, the government made mangrove conservation a national priority, designating dozens of mangrove forests as protected areas. But ironically, this has created a new issue for camel herders: Some research suggests the Kharai camels actually degrade mangroves. Research by Alagiri Thivakaran, a scientist at Gujarat Institute of Desert Ecology and one of India’s leading experts on mangroves, shows that by eating the growing buds of the trees, the Kharai camels can stunt their growth. He also says camels can also trample younger plants, causing them to die. The idea that camels are bad for mangroves has caused some policy makers in India to discourage herders from keeping them, according to research by Lyla Mehta and Shilpi Srivastava, social scientists at the Institute of Development Studies at the University of Sussex. “Some of these conservation groups don’t want local people to have access to mangroves,” Mehta, who has been conducting research in Kutch for 20 years, told Earther. However, Mehta noted that the science about camels and mangroves is disputed and that more research is needed. “If you talk to Sahjeevan and local NGOs in Kutch, they will tell you camels are actually good for the mangroves,” she said. Last year, Mehta and Srivastava published a paper on the relationship between people and mangroves in Kutch. They interviewed traditional herders who say camels’ hooves press mangrove seeds into the mud, helping them to germinate. Mehta and Srivastava believe a lot of the state-sponsored scientific research saying camels destroy mangroves undermines and undervalues the herders, who possess a deep understanding of their traditional landscapes. Even though their knowledge is not always in peer-reviewed journals, it still matters and should be considered. “Why would the camel be able to swim if they did not coexist with mangroves traditionally?” Mehta asked. Even Thivakaran believes that there are so few camels that they do not pose a significant threat to mangroves. “Mangroves and Kharai can definitely co-exist in Kutch,” he said. Mangroves aside, the Kharai camels face another existential threat. Many traditional herders are giving up camel breeding, or transitioning to other types of livestock, such as buffalo. That’s causing a precipitous decline in the animals’ numbers. In one hamlet called Phuleri, the camel head count went from 10,000 to only 80 over the past few decades. According to herders interviewed by Mehta and Srivastava, development on the coast makes it very difficult to graze their camels. And while camels used to provide manure for local agriculture, over the past few decades, their services have been largely replaced by synthetic fertilizers. Local organizations, such as Sahjeevan and the Camel Breeders Association, are determined to save the camels. In 2015, the groups were able to get the Indian National Bureau of Animal Genetic Resources to designate the Kharai as a distinct indigenous breed of dromedary (one-humped) camel. Joshi says this designation allows Kharai to get special status as a threatened indigenous species in India. 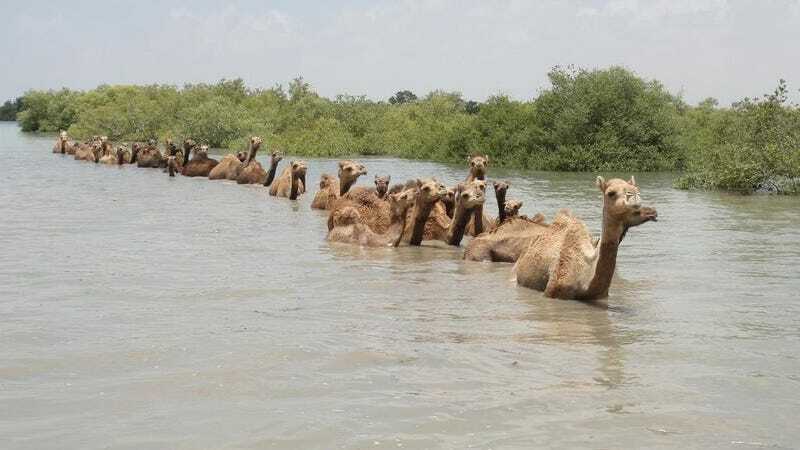 Joshi hopes that increased awareness about the swimming camel’s precarious state will spread to include the people who are responsible for the animal’s continued existence. Mehta and Srivastava agree. To respond to the economic changes that threaten the camel herding lifestyle, Sahjeevan is helping create a market for camel products, such as wool and milk, which have always been used by the herders but never used to be sold. They are in the process of piloting milk distribution systems, and they hope that camel milk from Kutch will soon be more widely available in the form of milk powder, soap or even chocolate. Last summer, Sahjeevan worked with local organizations to get camel milk officially recognized as an edible food item by The Food Safety and Standards Authority of India, which will make it easier for the dairy product to find its way to supermarket shelves. The camels breeders’ allies are also taking legal action. This past year, Sahjeevan and a camel pastoralist organization sued local salt miners for destroying patches of mangrove forest, and were successful in stopping the industrial encroachment. By not giving up on the Kharai camels, breeders and their supporters are also challenging the narrative of what development looks like in a region that has largely embraced industry. Camels and grass-huts may look anachronistic next to power plants, but Mehta and Srivastava believe that herders should not be bullied into giving up their way of life. Anna Kusmer is a radio reporter and freelance writer working on stories about science, health and environment. Her work has appeared in NPR, PBS, Smithsonian, Rewire.News and Atlas Obscura.